and textile industries, setting the standard for innovation, quality, and service. Other features include Printhead Teach Mode™; front and rear micro-registration; tool-free adjustable rear screen holders; print-start/print-finish mode; and M&R’s exclusive patented Revolver Print Program™, which automatically operates individual printheads in programmed sequence and allows multiple flashing without losing a printing position. Challenger III is also compatible with pre-press registration systems like M&R’s Tri-Loc and Double Tri-Loc. With so many features and an unmatched level of flexibility, convenience, and control, Challenger III D is simply the finest automatic carousel textile press ever made. M&R’s Sportsman EX automatic textile presses offer exceptional value and quality at an amazingly affordable price. Sportsman EX 1618 is available in 6, 8, and 10-color models with a maximum image area of 41 x 46 cm (16” x 18”). Sportsman EX 2020 is available in 6, 8, 10, and 12-color models with a maximum image area of 51 x 51 cm (20" x 20"). 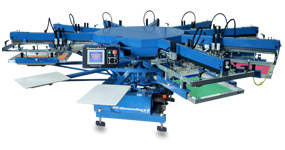 All models feature electric printheads, servo-driven indexers, multiple print-stroke capability, and a new color touch-screen interface with graphical displays and icon-based labeling that can show information and commands in numerous languages, simplifying press operation and training anywhere in the world. Also included are onboard self-diagnostics and real-time production data display. The press is compatible with M&R’s Tri-Loc® & Double Tri-Loc® Rapid Registration Systems. Pneumatic clamps hold frames tight and allow rapid screen loading. Standard features like independent squeegee & floodbar speed adjustments, adjustable rear screen holders, pneumatic squeegee/floodbar locks with tool-free angle adjustment, squeegee air regulators with pressure gauges on each printhead, independently-set angle and calibrated pressure adjustments, and independent print, reset, and print/flood speed controls on each printhead further simplify setup. Also standard are a tool-free pallet locator system, quick release pallet locks, and enhanced front micro-registration adjustments. Digital squeegee/floodbar speed displays enable easy, accurate speed adjustments at a glance. Central Off-Contact permits fast adjustment of all stations simultaneously. M&R’s exclusive patented Revolver Print Program™ automatically operates individual printheads in programmed sequence and allows multiple flashing without losing a printing position. Optional features include M&R’s patented Optical No-Shirt Detector, which minimizes the misprints and press stoppage that result from improper shirt loading. With its user-friendly touch-screen display and extensive standard-feature set, Sportsman EX is ideal for those seeking unprecedented affordability and versatility. The control center features touch-screen displays with onboard self-diagnostics; an independent print-start/print-finish setting that automatically activates and stops printheads at the beginning and end of production runs; multiple (1-9) print stroke capability; multi-print in the up position; real-time production data; and a countdown program that indicates when the operator-set index count has been reached. Control panels on Diamondback C, Diamondback S, and Diamondback XL are mounted on pivoting arms for easy access. All presses include M&R’s patented Revolver Print Program, which automatically operates individual printheads in programmed sequence and allows multiple flashing without losing a printing position. Options include M&R’s patented Optical No-Shirt Detector, which automatically prevents the press from printing on empty pallets, reducing misprints and minimizing press stoppage because of improperly loaded shirts. Optional Foot Pedal Control allows indexing of the press using a foot pedal. The Skip-Shirt foot pedal feature allows operators to bypass empty pallets. Presses can be ordered in configurations that allow them to fit through a 79 cm (31") doorway. Diamondback C, Diamondback S, and Diamondback XL can be ordered with an additional printhead for placement at the unload station. Diamondback L is a 6-color press with a maximum image area of 35 x 28 cm (14” x 11”) that can accept screen frames up to 51 x 61 x 4.5 cm (20” x 24” x 1.75”). Truly unique, it’s perfect for manual shops with limited space looking to break into automatic printing. At the same time, its high-speed servo and 259 cm (8’ 6”) diameter makes it ideal for larger shops interested in a press that requires little space—yet turns out tagless labels, pocket prints, and smaller-format images of exceptional quality. Diamondback L’s heavy-duty casters make it easy to move around the shop—or out of the way when it’s not in use. Diamondback C is similar to Diamondback L in size and affordability. It has a slightly larger diameter of 284 cm (9’ 4”), but a correspondingly larger maximum image area of 38 x 41 (15” x 16”). Diamondback C is available in 6 or 7 colors, and it’s perfect for those who need to print larger images, but only have room for a very compact press. Diamondback S was the first press to bring servo drive to the entry-level user. It’s available in 6, 7, 8 or 9 colors. It has a maximum image area of 41 x 46 cm (16” x 18”), and can accept screen frames up to 58 x 84 x 4.5 cm (23” x 33” x 1.75”). For those waiting for the right price on an entry-level automatic, the wait is over. Diamondback XL combines servo drive, large image area, and affordability. Diamondback XL is available in 8 and 9 colors. It has a maximum image area of 51 x 53 cm (20” x 21”), and can accept screen frames up to 66 x 91 x 4.5 cm (26” x 36” x 1.75”). It’s the ideal press for large images at a low cost. This press is clearly the most versatile, cost-effective manual press. The revolutionary Duo-Deck design has the features and durability to meet today's needs and the expandability to meet tomorrow's challenges. 4 & 6 color Chameleons expand up to 10 colors. 8 color Chameleons expand up to 14 colors. 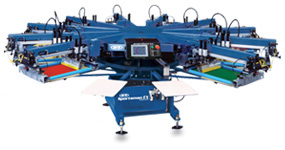 Sidewinder Solo is M&R's low-cost modular system for a wide range of screen printing applications. It's a single-head version of Sidewinder, the world’s best entry-level manual press. Built with M&R’s rugged construction and innovative design, Sidewinder Solo can be used as a tabletop one-color press or mounted on a floor stand. 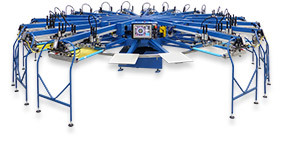 It can also be equipped with a vacuum pallet system for printing flat stock or with an extra-wide screen holder and pallet for printing oversize and all-over designs. In addition, Sidewinder Solo’s printhead can be removed from its modular base and added to a four-color Sidewinder to expand the Sidewinder's color capacity. Sidewinder Solo includes numerous proven design features, including a compact, strong, and stable base; a precise micro-registration system; and a three-point pallet leveling system. Side screen clamps are standard, and allow a maximum screen width of 66 cm (26”). The optional wide side clamps allow a maximum screen width of 127 cm (50”), making it possible to print oversize and all-over designs when the press is combined with the floor stand and an appropriately-sized printing pallet. All equipment from The M&R Companies is built with M&R's unsurpassed attention to detail and commitment to quality, durability, innovation, and design excellence, and is backed by M&R’s unparalleled 24-hour access to service, support, and premium parts. It’s no wonder M&R is the first name in screen printing equipment. Kruzer is M&R’s newest entry-level manual screen printing press, and it’s available at an unbelievably affordable price. Built with M&R’s rugged construction and innovative design, Kruzer includes numerous proven design features, including tapered-roller-bearing-supported upper and lower carousels, a precise micro-registration system, machined center shaft, and three-point pallet leveling system. Kruzer’s unique lever-adjusted off-contact system operates vertically, eliminating the need for a separate angle adjustment. Kruzer is offered in a 6-color/4-station model, and it’s designed to fit through a 78 cm (31") doorway when disassembled. Side screen holders and solid aluminum, low-profile, rubber-coated pallets are standard. M&R’s System Integration design allows M&R’s Kruzer manual press to integrate seamlessly with M&R’s easy-to-use Tri-Loc Registration Systems, the industry’s most efficient way to set up and register screens on both manual and automatic screen printing presses. Kruzer’s maximum screen width—58 cm (23”)—also fits most automatic presses. Kruzer delivers unprecedented quality, performance, and value in a manual screen printing press. It’s ideal for startup shops and for small and mid-size automatic shops in need of an exceptionally affordable high-quality manual press for sampling and small runs. Kruzer ships disassembled and boxed for onsite assembly, but can be ordered fully assembled and crated (additional charges apply). M&R is the world’s largest manufacturer of screen printing equipment, and the online M&R Store features a wide variety of genuine M&R OEM parts and screen printing supplies. M&R makes the world’s best sampling and production manual screen printing press, the world’s fastest automatic screen printing press, and the press that reinvented oval screen printing. M&R also created the most innovative athletic numbering press and enough other automatic and manual screen printing presses to serve virtually any need. All equipment from The M&R Companies is built with M&R's unsurpassed attention to detail and commitment to quality, durability, innovation, and design excellence, and is backed by M&R’s unparalleled 24-hour access to service, support, and premium parts.